This article is about the top division of the Scottish football league system from 1998 to 2013. For the current top division, see Scottish Premiership. The Scottish Premier League (SPL) was the top level league competition for professional football clubs in Scotland. The league was founded in 1998, when it broke away from the Scottish Football League (SFL). It was abolished in 2013, when the SPL and SFL merged to form the new Scottish Professional Football League, with its top division being known as the Scottish Premiership. A total of 19 clubs competed in the SPL, but only the Old Firm clubs, Celtic and Rangers won the league championship. For most of its history, the Scottish Football League had a two divisional structure (Divisions One and Two) between which clubs were promoted and relegated at the end of each season. However, by the mid-1970s, this organisation was perceived to be stagnant, and it was decided to split into a three divisional structure: Premier Division (formerly Division One), First Division (formerly Division Two) and a newly added Second Division. This system came into force for the 1975–76 season. This setup continued until the 1994–95 season, when a four divisional structure was introduced. This involved the creation of a Third Division, with all four divisions consisting of ten clubs. On 8 September 1997, the clubs in the Premier Division decided to split from the Scottish Football League and form a Scottish Premier League. This followed an earlier example in England, which came into force during the 1992–93 season. This decision was fuelled by a desire by the top clubs in Scotland to retain more of the revenue generated by the game. Originally, league sponsorship money was divided proportionally between clubs in all four divisions. After the SPL was formed, its clubs retained all of its commercial revenues except for an annual payment to the SFL and a parachute payment to relegated clubs. Teams received three points for a win and one point for a draw. No points were awarded for a loss. Teams were ranked by total points, then goal difference, and then goals scored. At the end of each season, the club with the most points was crowned league champion. If points were equal, the goal difference and then goals scored determine the winner. Originally the SPL contained 10 clubs, but it subsequently enlarged to 12 for the 2000–01 season and retained this structure until 2013. The increase from 10 clubs to 12 was part of the deal offered to obtain approval from SFL member clubs. After the expansion to 12 clubs, the SPL operated a "split" format. This was done to prevent the need for a 44-match schedule, based on playing each other four times. That format had been used in the Scottish Premier Division but was considered to be too high a number of matches in a league season. A season, which runs from August (except in 2011–12, when that season began in July) until May, was divided into two phases. During the first phase, each club played three matches against every other team, either once at home and twice away, or vice versa. After this first phase of matches, by which time all clubs had played 33 matches, the league split into a "top six" and a "bottom six". Each club then played a further five matches against the other five teams in their own section. Points achieved during the first phase of 33 matches were carried forward to the second phase, but the teams competed only within their own sections during the second phase. After the first phase was completed, clubs could not move out of their own section in the league, even if they achieved more or fewer points than a higher or lower ranked team, respectively. At the beginning of each season, the SPL "predicted" the likely positions of each club in order to produce a fixture schedule that ensured the best possible chance of all clubs playing each other twice at home and twice away. This was known as the league seeding and was based on clubs' performance in previous years. If a club did not finish in the half where it was predicted to finish, it faced the possibility of playing an unequal number of home and away matches. For example, one club would sometimes play another three times at home and once away. There was criticism of the split season format. In April 2007, Craig Levein labelled it as "rubbish" and a "nonsense", claiming it resulted in lost revenue for clubs and put more pressure on managers, while Rangers manager Walter Smith branded the format as "unfair" and called for an 18-team league to be considered. However, the SPL defended the split format, dismissing the possibility of expanding the league due to a lack of strong enough clubs within the Scottish Football League. In March 2008, Kilmarnock manager Jim Jefferies was the latest to call for a league revamp, claiming the potential for four matches per season against the same opponent was too many. The bottom placed SPL club at the end of the season was relegated, and swapped places with the winner of the Scottish First Division, provided that the winner satisfied the SPL entry criteria. These promotion criteria sometimes caused controversy. In 2003, the chairmen of the member clubs voted against Falkirk's proposed ground share with Airdrie United and stopped the club from having the 10,000 capacity stadium it required, therefore saving Motherwell from relegation. The same situation nearly materialised in 2004. After several votes and discussion, including threats of court cases from Partick Thistle, the team threatened with relegation, Inverness Caledonian Thistle were promoted on the basis that they would ground share with Aberdeen at Pittodrie. In 2005, the stadium size criterion for entry to the SPL was reduced to 6,000, thereby allowing Inverness Caledonian Thistle to return to their home stadium during the 2005–06 season. One of the main criticisms of the SPL was the dominance of the two Old Firm clubs, Celtic and Rangers. No team outside the Old Firm has won the Scottish league championship since 1985. Until Rangers were ejected from the SPL due to their liquidation, there was only one SPL season (2005–06) where both clubs failed to occupy first and second positions, with Hearts finishing second behind Celtic. While other European leagues were dominated by a few clubs in the 2000s, the Old Firm dominance in Scotland dated back to the beginning of Scottish league football, with a few exceptional periods. 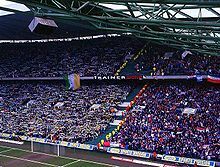 The average home attendances of both clubs is significantly higher than the other Scottish clubs, which resulted in the Old Firm having far greater revenues and therefore more money to spend on players. Both clubs also received significant revenues from participation in the UEFA Champions League and the UEFA Europa League. Despite having more resources than other Scottish clubs, the Old Firm experienced difficulty in competing with big clubs from other leagues in terms of transfer fees and player wages due to the SPL's relatively low television revenue. A recurring theme during the existence of the SPL was the prospect of the two clubs leaving the Scottish football set-up to join the English football league system, an Atlantic League with clubs from countries such as the Netherlands, Belgium and Portugal, or forming a new European Super League. While some observers believed the departure of the Old Firm from the Scottish football setup would be detrimental to Scottish football as a whole, others, such as Craig Levein, believed it would benefit Scottish football due to increased competition among the remaining clubs for the SPL title. World football's governing body FIFA ruled out the prospect of any Old Firm move to the English set-up. The duopoly was effectively broken when Rangers entered administration in 2012 and was liquidated after it failed to reach an agreement with creditors. Rangers was relaunched by a new company and were voted into the Scottish Football League Third Division. In March 2013, Rangers chief executive Charles Green suggested that Rangers could join the Football Conference and that EU competition law banning restraints of trade could be used to overcome any legal barriers to such a plan. Green also suggested that Rangers and Celtic would not be playing in the Scottish league system in ten years time. Scotland manager Gordon Strachan said he believed the Old Firm clubs would join a future new 38-club two-division European Super League. The SPL instituted a "winter break" during the January of each season, beginning with the 1998–99 season. However, this practice was removed beginning in the 2000–01 season, forcing clubs to play throughout January and sometimes resulting in postponement of matches and significant damage to clubs' pitches. Managers Martin O'Neill, Jim Duffy and Walter Smith were among those who called for the winter break to be reinstated. Alex McLeish accused the SPL of taking Scottish football "back to the Dark Ages" after its decision to scrap the mid-season hiatus. In the seasons after the SPL's inception, Scotland's UEFA coefficient improved significantly, having been ranked 26th in 1998–99, they reached a high of 10th at the end of the 2007–08 season. The SPL ranking thereafter declined, the league falling back to the 24th position at the end of 2012–13. In 2003, Celtic became the first Scottish club since Dundee United in 1987 to reach a European final, eventually losing 3–2 to Porto after extra time in the UEFA Cup final. In 2003–04, two Scottish clubs, Celtic and Rangers, qualified for the UEFA Champions League for the first time. In 2005–06, Rangers became the first Scottish club to reach the knockout stage of the Champions League, a feat repeated by Celtic the following two seasons. In the 2007–08 season, three Scottish clubs were competing in Europe after Christmas for the first time since 1970, while in the same season, Rangers reached the 2008 UEFA Cup final, but lost 2–0 to Russian club Zenit Saint Petersburg. During the season, Scotland's European representatives collected the most coefficient points since the 1982–83 season. Scottish Premier League clubs had almost complete freedom to sign whatever number and category of players they wish. There was no team or individual salary cap, no squad size limit, no age restrictions other than those applied by general employment law, no restrictions on the overall number of foreign players and few restrictions on individual foreign players. All players with EU nationality, including those able to claim an EU passport through a parent or grandparent, were eligible to play, and top players from outside the EU were able to obtain UK work permits. The only restriction on selection was the "Under-21 rule". This rule stated that each club must include at least three players under the age of 21 in its matchday squad. Opinions on this rule were divided among SPL managers. Walter Smith, Gus MacPherson and Jim Jefferies expressed their disapproval of the policy. John Collins approved of the ruling, claiming it is healthy for Scottish football and encouraged the development of young players. A decline in television revenue resulted in relatively little spending among SPL clubs, with major transfer spending mostly limited to the Old Firm clubs. As a result, most clubs became reliant on developing their own young players and selling them on for profit. This also resulted in a large proportion of SPL clubs' squads being made up of Scottish players (73% in the 2004–05 season). Due to its relatively low income from television and commercial partners, Scottish clubs were highly dependent on revenues from fans attending matches. More people in Scotland per head of population watched their domestic top-level league than any other European nation. All ten of the clubs that played in the 1998–99 Scottish Premier League also participated in the 2011–12 Scottish Premier League. Nine of those ten clubs recorded lower average attendance. Celtic had a 14% decline in attendance since a peak season of 2000–01, when the club won the domestic treble. Dunfermline, who were newly promoted to the SPL in 2011–12, only saw an increase of 939 in average attendance from the 2010–11 Scottish First Division season. They also attracted a bigger crowd for a Fife derby game in the First Division against Raith Rovers than any game in the SPL. The Bank of Scotland, which had sponsored the league since March 1999 (the League was unsponsored for most of the inaugural season), did not renew its sponsorship at the end of the 2006–07 season. Talks began with Clydesdale Bank, and a four-year contract worth £8 million came into effect from July 2007; in 2010, the contract was extended until 2013. During the SPL era, six of its member clubs entered administration. Serious financial difficulties first arose in 2002 when broadcaster Sky Sports withdrew its interest in the League's television rights when the SPL rejected its offer of £45 million, hoping a better deal would arise from another broadcaster. However, a superior deal failed to arise, adding to the clubs' already delicate financial position. Total debt among SPL clubs was estimated during 2001–02 to be around £132m, having been barely into double figures two years previously. Motherwell became the first SPL club to enter administration in April 2002, with debts of £11 million and a wage bill totalling 97% of the club's annual turnover. Dundee were next to follow, when in November 2003 it sacked 25 staff after debts of £20 million. The severity of the SPL's financial problems were revealed in September 2003 when combined losses for SPL clubs during 2001–02 was estimated to have been £60 million. A report by PricewaterhouseCoopers (PWC) in 2003 described five SPL clubs – Dundee, Dunfermline Athletic, Hearts, Hibernian and Livingston – as "technically insolvent". Livingston became the third SPL club to enter administration in February 2004 with debts of £3.5 million. Dunfermline Athletic's financial position also looked bleak, with several players asked to take wage-cuts, while Rangers chairman David Murray announced in September 2004 a plan to raise £57 million via a rights issue in an attempt to eliminate a large proportion of the club's debts. After widespread cost-cutting measures, the finances of SPL clubs began to show signs of improvement. Both Motherwell and Dundee came out of administration in April and August 2004 respectively, while Livingston ended its 15-month spell in administration in May 2005. The 2006 report on SPL finances by PWC revealed operating profits of £2.8 million among SPL clubs, the first collective operating profit made by Scotland's top-flight clubs in over a decade. Seven of the SPL's 12 clubs had a wage turnover ratio of less than 60%. The 2007 report by PWC revealed a collective loss of £9 million for 2005–06, although six clubs – Falkirk, Hibernian, Inverness CT, Kilmarnock, Motherwell and Rangers – made a profit. The report highlighted the increasingly precarious financial position of Hearts, describing its current finances as "unsustainable" with debt rising by £7 million to £28 million and a wage bill which represents 97% of its turnover. The figures for 2006–07 showed a collective profit of £3 million, with eight clubs making a profit. In March 2008, Gretna became the fourth SPL club to enter administration. The club's main benefactor, Brooks Mileson, was forced to withdraw his financial support due to failing health. The club was liquidated after it had been relegated to the Scottish Football League at the end of the 2007–08 Scottish Premier League. Gretna fans formed a new club, Gretna 2008, which entered the East of Scotland Football League. With the financial crises and the UK economic recession, SPL clubs were badly affected. A reduction in revenue from ticket sales for SPL matches and club merchandise impacted negatively on club expenditure. Players were asked to consider wage cuts and team squads were reduced. Indeed, some clubs may reduce the number of non-playing staff. During 2009 and 2010, the financial constraints at Rangers were widely reported, with the club's debt rising to £30 million. The 21st PWC annual review found that SPL clubs made a collective loss of £22 million during the 2008–09 season, although this loss was almost entirely due to problems at two clubs. Rangers incurred a £14 million loss after losing most of their European revenues due to an early defeat by FBK Kaunas, while Hearts lost £8 million. In 2010, Hearts was described by The Scotsman as the only true financial "basket case" in the SPL, with the club having a wages-to-turnover ratio of 126% and debt of over three times turnover. Rangers stabilised financially in the next two seasons, thanks to income generated from Champions League participation. Rangers entered administration on 14 February 2012, owing an approximate £9 million in unpaid taxes and with an ongoing tribunal with HMRC. HMRC blocked a proposed Company Voluntary Arrangement in June 2012, forcing preferred bidder Charles Green to use a new company to buy out the business and assets of Rangers. Weeks before the SPL merged into the Scottish Professional Football League, Hearts became the sixth SPL club to enter administration. Between 1998–99 and 2001–02, exclusive television rights for live Scottish Premier League matches were held by Sky Sports. In January 2002, the SPL rejected a £45 million offer from Sky Sports and began considering setting up its own pay-per-view channel, dubbed "SPL TV". However, these plans broke down in April 2002 when the Old Firm clubs – Rangers and Celtic – utilised the 11–1 voting system to veto the proposals. This caused discontent among the remaining ten SPL clubs, which subsequently announced their intention to resign from the league. Despite a two-year television deal being agreed with BBC Scotland in July 2002 for a significant amount less than previously offered by Sky Sports, the ten non-Old Firm clubs confirmed their resignation from the SPL in August 2002, citing discontent with the voting system. The ten clubs withdrew their resignations in January 2003 after an agreement was reached to change some of the voting procedures and to change the distribution of TV revenue. The SPL agreed a television rights deal with Irish broadcaster Setanta Sports in February 2004 in a four-year deal worth £35 million. This deal was revised in 2006, with a two-year extension to the original deal agreed, the new four-year deal now being worth £54.5 million and running to 2010. In June 2008, it was announced that a further four-year deal would commence for the 2010–11 season, worth £125 million. Setanta lost the rights to show live SPL matches in the United Kingdom as it was unable to pay the £3 million it owed to the SPL. The SPL then agreed a deal with ESPN and Sky Sports worth £13 million per season to the clubs. This was comparable to the deal which was in place with Setanta, but it was around half the amount Setanta was due to pay from 2010. The Old Firm criticised the decision of nine of the other SPL clubs to accept that offer from Setanta, instead of taking an alternative package from Sky that would have been worth significantly more than the deal signed after Setanta went into administration. In 2009, Sky and ESPN agreed a five-year deal with the SPL where they would pay a total of £65 million for the rights to show 30 matches each per season. In November 2011, it was announced that a five-year extension to the contract would commence from the 2012–13 season. This deal was amended after Rangers entered insolvency and was not allowed to transfer its SPL membership to a new company. The rights held by ESPN were acquired by BT Sport in February 2013. BBC Scotland's Sportscene held the rights to broadcast highlights of each match first on terrestrial TV. The BBC also held the rights to show online Internet highlights to UK users for one week after each match. BBC Alba, launched in September 2008, showed one full SPL match per week in delayed coverage. BBC Alba will also showed some live matches in the 2012–13 season. The SPL was broadcast in Australia by Setanta Sports Australia, in Canada by Sportsnet World and in the United States by Fox Soccer Channel and Fox Soccer Plus. Radio broadcasting rights were held by BBC Radio Scotland. BBC Radio Scotland also provided internet webcasts to all Scottish Premier League matches, having become the first broadcaster to introduce such a service in June 2000. Old Firm matches were also broadcast on BBC Radio 5 Live and 102.5 Clyde 1. The clubs listed below competed in the Scottish Premier League. Teams in italics are founder members. The following stadia were used by clubs in the Scottish Premier League. Celtic Park, the biggest stadium by capacity used in the SPL. Almondvale Stadium Livingston and Gretna Gretna played one home game at Almondvale during the 2007–08 season due to the bad condition of the Fir Park pitch. Celtic Park Celtic The biggest club stadium in Scotland by seating capacity. Fir Park Motherwell and Gretna Gretna used Fir Park for most of the 2007–08 season because their normal home ground, Raydale Park, did not meet SPL requirements. Love Street St Mirren Love Street was closed in January 2009. McDiarmid Park St Johnstone First purpose-built all-seater stadium in Scotland. Pittodrie Stadium Aberdeen and Inverness C.T. Inverness C.T. moved to Aberdeen's Pittodrie Stadium for part of the 2004–05 season while the Caledonian Stadium was upgraded. St Mirren Park St Mirren Opened in January 2009. This table is a cumulative record of all SPL matches played. The table is accurate from the 1998–99 season to the end of the 2012–13 season, inclusive. Kilmarnock and Rangers player Kris Boyd scored the most goals in the SPL, with 167 goals. He broke the previous record of 158, set by Henrik Larsson, by scoring five goals for Rangers in a 7–1 win against Dundee United on 30 December 2009. Boyd and Larsson were the only players who scored more than 100 goals in the SPL era. There are players who scored far more goals in the predecessor Scottish Football League competition, with Jimmy McGrory holding the overall record with 408 goals in the top flight of Scottish football. ^ The Scottish Premier League only existed between 1998 and 2013. For a complete record of clubs that have won Scottish league championships, see list of Scottish football champions. ^ The SPL was expanded from 10 teams in 1999–2000 to 12 teams in 2000–01. There was due to be a play-off involving the team that finished bottom of the SPL (Aberdeen) and the teams finishing second and third in the First Division (Dunfermline Athletic and Falkirk) for two places in the SPL, but this was cancelled because Falkirk did not meet the stadium criteria for SPL membership. ^ Motherwell finished bottom of the SPL but avoided relegation because the team that finished top of the First Division (Falkirk) did not meet the stadium criteria for SPL membership. ^ Rangers were deducted 10 points for going into administration in the 2011–12 season. ^ Gretna were deducted 10 points for going into administration in the 2007–08 season. ^ Clubs only include those where players scored goals in the Scottish Premier League. ^ a b c d e Player also scored goal(s) in the Scottish Football League. ^ Gretna's points total would have been 23 points without a 10-point administration penalty they received. The lowest points total without such a penalty is 18 points, which was recorded by Livingston in 2005–06. ^ "Scottish Football League clubs vote in favour of a proposed merger with the Scottish Premier League". BBC Sport. Retrieved 2013-06-12. ^ a b c "SPL stand by their split decision". Sunday Herald. 8 August 1999. Retrieved 22 March 2008. ^ "The SPL split makes no sense, insists Levein SPL split is a nonsense, insists Craig". Daily Mail. UK. 7 April 2007. Retrieved 22 March 2008. ^ "Smith in blast at SPL split decision". Daily Mail. UK. 21 April 2007. Retrieved 22 March 2008. ^ "Jefferies wants a new-look league". Sporting Life. Retrieved 22 March 2008. ^ Jonathan Coates (24 May 2003). "Falkirk lose out as SPL closes ranks and denies them place". The Scotsman. UK. Retrieved 26 March 2008. ^ "Inverness win SPL vote". BBC Sport. 22 June 2004. Retrieved 26 March 2008. ^ a b "Inverness are homeward bound". BBC Sport. 7 June 2004. Retrieved 25 March 2008. ^ a b c d e f Grahame, Ewing (13 July 2012). "Low in attendance, low in achievement – the SPL's dismal legacy of failure". sport.scotsman.com. Johnston Press. Retrieved 29 July 2012. ^ "Dutch resurrect Atlantic League". BBC Sport. 24 April 2002. Retrieved 26 March 2008. ^ a b Ziegler, Martyn; Esplin, Ronnie (10 April 2013). "Celtic and Rangers will join European super league, says Scotland manager Gordon Strachan". The Daily Telegraph. London: Telegraph Media Group. Retrieved 21 May 2013. ^ "Blatter opposes Old Firm switch". BBC Sport. BBC. 7 March 2008. Retrieved 26 March 2008. ^ "Old Firm urged to talk". BBC Sport. BBC. 12 May 2002. Retrieved 26 March 2008. ^ "Levein wants Old Firm kicked out". BBC Sport. BBC. 7 April 2002. Retrieved 26 March 2008. ^ "Fifa writes off Old Firm hopes". BBC Sport. 30 July 2001. Retrieved 26 March 2008. ^ "SPL has coped with loss of Rangers, says Neil Doncaster". BBC Sport. BBC. 10 October 2012. Retrieved 11 October 2012. ^ a b McLeman, Neil (24 March 2013). "Ger'd your loins! Glasgow Rangers will be playing in England within FIVE YEARS says Ibrox chief". Daily Mirror. London: Trinity Mirror. Retrieved 21 May 2013. ^ a b c "McLeish berates SPL". BBC Sport. BBC. 25 March 2003. Retrieved 22 March 2008. ^ "Football: BRING BACK BREAK". Daily Mirror. UK. 12 June 2005. Retrieved 22 March 2008. ^ a b "SPL praises Euro performances". BBC Sport. 22 March 2008. Retrieved 22 March 2008. ^ "UEFA Country Ranking 2011". UEFA European Cup Football Results and Qualification. Bert Kassies. 17 May 2011. Retrieved 17 May 2011. ^ "Porto end Celtic's Uefa dream". BBC Sport. 21 May 2003. Retrieved 9 May 2008. ^ "Rangers 1–1 Inter Milan". BBC Sport. 6 December 2005. Retrieved 9 May 2008. ^ "Celtic 1–0 Man Utd". BBC Sport. 21 November 2006. Retrieved 9 May 2008. ^ "AC Milan 1–0 Celtic". BBC Sport. 4 December 2007. Retrieved 9 May 2008. ^ Murray, Ewan (20 December 2007). "Calderwood aims to end 37 years of Scottish hurt in Europe". The Guardian. UK. Retrieved 9 May 2008. ^ "Zenit St Petersburg 2–0 Rangers". BBC Sport. 14 May 2008. Retrieved 16 May 2008. ^ a b Murdoch, Jamie (17 August 2007). "SPL face fresh criticism over under-21 rule". The Daily Telegraph. UK. Retrieved 22 March 2008. ^ "FAQs". Scottish Premier League. Archived from the original on 15 March 2008. Retrieved 22 March 2008. ^ Parks, Gordon (21 January 2011). "Scottish football still drawing biggest crowds per head of population in Europe, says SPL chief". Daily Record. Trinity Mirror. Retrieved 6 July 2013. ^ "Clydesdale in SPL sponsor talks". BBC Sport website. 11 October 2006. Retrieved 4 January 2010. ^ "Clydesdale are new SPL sponsors". BBC Sport. BBC. 19 October 2006. Retrieved 4 January 2010. ^ "Clydesdale Bank extends sponsorship deal with SPL". BBC Sport. BBC. 19 April 2010. ^ a b c d e Philip, Calum (13 February 2004). "Dark days ahead for debt-ridden Scottish clubs". The Daily Telegraph. London. Retrieved 25 March 2008. ^ "SPL posts record losses". BBC Sport. BBC. 23 September 2003. Retrieved 25 March 2008. ^ "Livi in administration". BBC Sport. BBC. 3 February 2004. Retrieved 25 March 2008. ^ "Pars players face wage cuts". BBC Sport. BBC. 2 February 2003. Retrieved 25 March 2008. ^ "Rangers to raise £57m". BBC Sport. BBC. 1 September 2004. Retrieved 25 March 2008. ^ "'Well end administration". BBC Sport. BBC. 20 April 2004. Retrieved 25 March 2008. ^ "Dundee to enter new era". BBC Sport. BBC. 5 August 2004. Retrieved 25 March 2008. ^ "Livingston out of administration". BBC Sport. BBC. 13 May 2005. Retrieved 25 March 2008. ^ a b "SPL continues economic recovery". BBC Sport. BBC. 3 October 2006. Retrieved 25 March 2008. ^ a b "Hearts buck debt reduction trend". BBC Sport. BBC. 15 August 2007. Retrieved 25 March 2008. ^ "Profits on the up for SPL clubs". BBC Sport. BBC. 27 August 2008. Retrieved 27 August 2008. ^ a b "Gretna edging closer to closure". BBC Sport. BBC. 13 March 2008. Retrieved 25 March 2008. ^ a b "Gretna are on the long road back". The Scotsman. Johnston Press. 29 August 2008. Retrieved 16 June 2012. ^ "Clubs expect more financial woes". BBC News. BBC. 17 March 2009. Retrieved 17 March 2009. ^ Hannah, Roger (28 February 2009). "Slash and burn". The Scottish Sun. News International. Retrieved 3 January 2010. ^ "Penny pinching Rangers". Daily Mail. UK. 7 March 2009. Retrieved 7 March 2009. ^ "Rangers offer redundancy packages". BBC Sport. BBC. 7 March 2009. ^ "Crisis Could Put Gers in Celtic's shadow for 10 years". News of The World. News International. 15 March 2009. Retrieved 15 March 2009. ^ a b c d Smith, Andrew (19 August 2010). "Credit crunch takes its toll on SPL as £23m profit becomes £22m loss". The Scotsman. UK. Retrieved 19 August 2010. ^ Clark, John. "Notice of administrator's appointment" (PDF). Registrar of Companies. Archived from the original (PDF) on 17 April 2012. Retrieved 12 April 2012. ^ Whitehouse, David. "Joint Administrators' Report and Statement of Proposals" (PDF). Duff & Phelps. Archived from the original (PDF) on 16 April 2012. Retrieved 12 April 2012. ^ Fraser, Douglas (14 June 2012). "Sky sets the limit". BBC News. BBC. Retrieved 16 June 2012. ^ "FANS GET A TELLYFUL; SPL set to launch its own TV station as Sky switch off". Daily Record. 16 January 2002. Retrieved 23 March 2008. ^ "Old Firm scupper SPL TV". BBC Sport. BBC. 8 April 2002. Retrieved 23 March 2008. ^ "Scottish league faces collapse". BBC Sport. BBC. 16 April 2002. Retrieved 23 March 2008. ^ "SPL signs BBC deal". BBC Sport. BBC. 31 July 2002. Retrieved 27 March 2008. ^ "Scottish clubs quit SPL". BBC Sport. BBC. 1 August 2002. Retrieved 23 March 2008. ^ "SPL ends internal strife". BBC Sport. BBC. 22 January 2003. Retrieved 23 March 2008. ^ "Setanta wins SPL TV deal". BBC Sport. BBC. 26 February 2004. Retrieved 23 March 2008. ^ "Record-breaking TV deal for SPL". www.scotprem.com. Scottish Premier League. 30 June 2008. Archived from the original on 3 July 2008. Retrieved 30 June 2008. ^ a b c "SPL agrees TV deal with Sky/ESPN". BBC Sport. BBC. 16 July 2009. Retrieved 6 August 2010. ^ a b "Old Firm blast SPL over TV deal". BBC Sport. BBC. 16 July 2009. Retrieved 6 August 2010. ^ "SPL secures new five-year TV deal with Sky and ESPN". BBC Sport. BBC. 21 November 2011. Retrieved 10 May 2012. ^ "Sky reveals new SPL TV deal for five years". BBC Sport. BBC. 31 July 2012. Retrieved 31 July 2012. ^ "BT buys ESPN's Scottish Premier League TV rights". BBC Sport. BBC. 25 February 2013. Retrieved 25 February 2013. ^ a b "New TV deal on Scottish football". BBC News. BBC. 16 November 2012. Retrieved 16 November 2012. ^ "BBC welcomes radio deal". BBC Sport. BBC. 26 February 2004. Retrieved 23 March 2008. ^ "BBC scores Scottish winner". BBC Sport. BBC. 14 June 2000. Retrieved 23 March 2008. ^ "The planned venues". BBC Sport. 9 December 2002. ^ "Saints savour 20 years at McDiarmid Park". The Scotsman. UK. 25 July 2009. ^ a b c d e f g h i j k l m n o p q r s t u v w x y z aa ab "Records". Scotprem.com. Archived from the original on 24 May 2013. Retrieved 3 January 2010. ^ "Scottish Premier League | Scottish Football Results & News". Scotprem.premiumtv.co.uk. 30 December 2009. Archived from the original on 2 November 2005. Retrieved 3 January 2010. ^ Scotland – All-Time Topscorers, RSSSF. ^ a b c d e f g h i j k l "Individual records". Scottish Premier League. Archived from the original on 2 September 2010. Retrieved 23 May 2010. ^ "Commons sets SPL record for fastest goal". www.scotprem.com. Scottish Premier League. Retrieved 18 March 2013. ^ a b c d e "Statistics". www.scotprem.com. Scottish Premier League. Archived from the original on 12 June 2011. Retrieved 18 May 2013. Cite error: Invalid <ref> tag; name "SPL statistics" defined multiple times with different content (see the help page). ^ "Flo goes to Rangers". BBC Sport. 23 November 2000. Retrieved 22 March 2008. ^ "Aiden McGeady completes record move to Spartak Moscow". BBC Sport. 13 August 2010. Retrieved 13 August 2010. ^ "Celtic win race for Hibs' Brown". BBC Sport. 15 May 2007. Retrieved 22 March 2008.